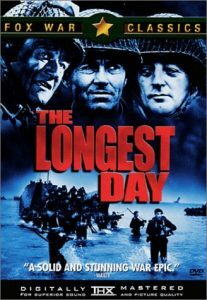 This monumental account of the allied invasion of Normandy on D-Day (June 6, 1944) is a classic among WWII films. Spectacular battle scenes; intense acting by John Wayne, Henry Fonda, Sean Connery and Sir Richard Burton, among others; and gut-wrenching pathos capture the horrors and heroics of a defining historical event. 1962; black and white, 3 hours.